Washington State, US has joined the war on vessel emissions, having unveiled plans for a locally designed, built and operated, eco-friendly ferry. 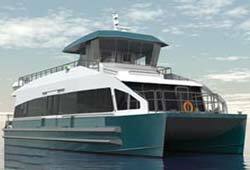 Once completed, the passenger-only, battery-diesel ferry will operate on Puget Sound, on Washington’s north-west coast, deploying hybrid technology to provide clean crossings for residents and tourists. Development of the vessel has remained an ‘all-Washington job’: her design has been supplied by Seattle-based naval architect and marine engineering consultancy Glosten, while Bellingham-based builder All American Marine will handle her construction. The completed ferry will be delivered to public transportation provider Kitsap Transit, which will oversee her operations in Puget Sound. Developed with an aluminium catamaran hull, the ferry will measure 21.3m x 7.9m and feature a depth of 2.44m, a loaded draught of 1.85m and the capacity to carry up to 150 passengers per trip – or more than 350,000 annually. When fully loaded, the vessel will displace 57 long tonnes (approx. 58tonnes), Glosten tells Ship & Boat International. Power will be supplied by two BAE Systems HybriDrive propulsion units, capable of delivering 300kW per shaft and driving fixed-pitch propellers, Glosten adds. This configuration should grant the ferry a speed of 16knots at half-passenger load. William Moon, project manager and design lead at Glosten, adds: “Outfitted with a battery-diesel hybrid propulsion system, the vessel will operate like a Prius – no more diesel exhaust and noise while passengers load and unload.” The ferry’s diesel engines will recharge the batteries, though the vessel will also be able to access shore power overnight.